Paw Talk - Pet Forums > Wild Animals > Animals in the Wild > -Photos- Disneyland Wildlife caught in a Photo by MzKity! Disneyland Wildlife caught in a Photo by MzKity! I'm not sure if this is the correct place to post this or not, but I'll start here. In our mad dash through Disneyland, I decided to stop and smell the roses, so to say and discovered this little guy. And, he was "little"!! I used my "micro" setting on my camera to get these shots. I hope you enjoy these as much as I did taking them. I had to control myself, I wanted to take him home with me! LOL. But I knew better. He was absolutely adorable and so perfect. But, he belonged in Disneyland. 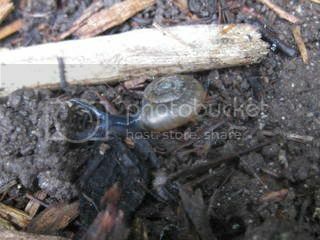 Without more delay, meet the little snail that brought me so much joy! Don't you just want to pick him up and hold him? I'm going to be looking for one now here in town because I think it will make a great addition to one of my terrariums. LOL I'll take his picture with me to my pet store to see if they can get me a few. Hee hee. Aww, it's Gary the snail from Spongebob, what's he doing in DisneyLand? He's so tiny and cute! OMG! Nikko, that's just what my son said! I think he was on vacation too! LMAO. Wasn't he adorable. And he was quite nice to take a photo shoot for me. LOL. Awwe, I never made it out there! Too cute. 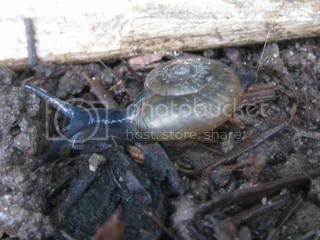 LOL this just reminds me of my first pet He was a lil snail just like that I found when we where on vacation in CA... We took him home and I named him Slurry (I was, like, 3 years old!). He was my first pet ever, and I think he lived a year or two. We still have vidoes of him crawling up my arm! Awwe, Jess! No problem. What do you feed these little guys? Because I am totally serious about asking my pet store to find some for me. Hee hee. I loved him. But I knew he needed to stay in Disneyland. I think he was really Sponge Bob's "Gary" the Snail on vacation! LOL. You know, everyone has to be on vacation somewhere! hee hee. I always just fed mine romain lettuse... I dont remember if we fed him anything else. Just dont feed it anything salty- he probably wouldnt like that! Cute! I use to keep snails when I was a kid and I use to feed them all diffrent kinds of greens and veggies, sometimes pieces of fruit. Aww he is cute! 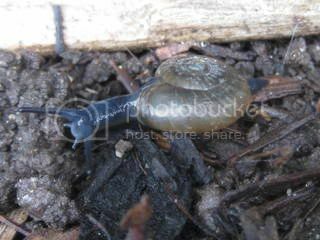 When i was a kid we had 2 giant african snails...they were awesome pets! We fed them cucumber and other veggies and greens and they loved cutlefish!! Awwe, I can't wait to find a couple now!